Developer: ID software, produced by EA games. ESRB rating: “T” for blood and gore, fantasy violence and use of alcohol. "You are the son of the legendary Elven adventurer Eol and the Valkyrie Fraiga. 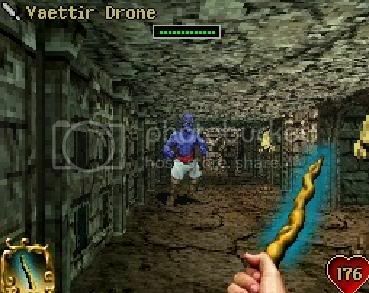 Your father has gifted you with a rare and powerful wand named Ellon, a sentient weapon capable of communication. Now, as a young man, you’ve set your own course for adventure with Ellon as your constant guide and companion. Your journey begins when Ellon receives an unexpected and cryptic message. You both believe this message is from King Brahm, a close friend of your father’s and the ruling king of the ancient Dwarven citadel at mount Zharrkarag. Though perplexed at the lack of detail in the message, you feel compelled to travel to mount Zharrkarag and meet with the king. Upon arrival, what you discover is that things are worse than you expected. It appears that a band of Orcs has overrun the place, wreaking havoc and leaving destruction in their wake, and your wand Ellon has mysteriously diminished in strength. Worst of all, King Brahm is nowhere to be found. Strong points: Fun game with a classic play style, assuming you like that. Weak points: Graphics aren’t the best, sound is terrible, and the classic style may be too classic for some people. Moral warnings: Drunkenness is required to complete the game, violence is surprisingly high, and dark magic is used by the bad guy. 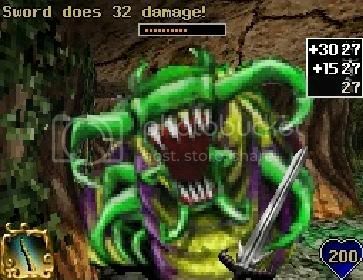 Orcs, Elves, and other unsavory sorts await in this turn based action RPG that is, in the end, a dungeon crawler without long periods of grinding required. You may also notice this game was created by Id, the folks behind Doom. The object of the game is to guide Eli through the Dwarven mountain and find out what happened to the Dwarves and their king. Along the way, you will fight numerous enemies, search for hidden areas, avoid traps and even barter with a dragon. This will take you around 4-6 hours to do, depending on whether or not you search for all the secrets and the difficulty you choose to play on. 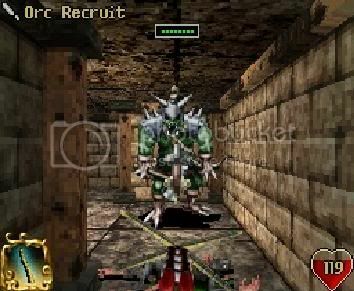 Orcs and Elves is seemingly based on the old school dungeon crawlers, in which you had to use pencil and paper to plot out a map of the dungeon you were in. Those were a bit before my time, but I love the style of game. Luckily, Orcs and Elves comes equipped with a magic map accessible on the bottom screen. Magic apparently means no drawing necessary, as where you’ve walked is plotted automatically. The map comes in handy, as you will be wandering through labyrinths and caves and other such monster ridden locales. Searching for hidden areas and fighting is basically the entirety of the game, with simple puzzles thrown in for measure. This never had time to get repetitious though, since the game is short enough that it still seems fun to slay various monsters by the end. The game has a ranking system, and you may be tempted to go through it several times. I enjoyed the game enough to try it on all the difficulties, and Nightmare mode is definitely a challenge. But unless you loved the game the first time through, their are very few incentives to play it more than once. You can unlock all the artwork on the first play through, and their are no multiple endings unless you count getting a different rank. Though earlier I said the game is an action RPG, that’s not exactly true. I found this game very hard to classify, because it involves first person perspective, paired with turn-based exploration and combat. Each action you do takes a turn, including steps, item uses, and weapon swings. Enemies make a move (or sometimes two) then allow you to attack, move, etc. It’s a very quick turn based system though. There are several weapons to choose from, including the basic sword, to a magical blade to crossbows and dragons fire. The variety comes in handy, as different weapons affect different enemies. You can purchase rings, armor and weapons from Gaya, the dragon, assuming you haven‘t made her angry enough to burn you up, that is. Certain rings you can find around the world, but unfortunately, you’re forced to purchase armor and weapons. Rings can be switched between as needed, since you’ll find them with different powers. You can even find one that makes you perpetually drunk, dropping your accuracy but increasing evasiveness and power. The armor system is something I’ve never encountered before, in that you’ll need to repair it periodically as it takes damage and decreases in it’s defense rating. This was originally a Cell phone game, enhanced and having features added to the DS version. It shows though, as the graphics are very simple textures and sprites. Though first person and 3D for the most part, most characters and enemies are sprites with a 3D spin. The textures of the corridors are different for every level, and many of the items in the environment are destructible. Enemies though, are recycled with a different layer of paint for different varieties of enemies. Red goo means lava, green is slime, etc. They aren’t terrible, but they certainly don’t show off the DS’s capabilities. Movement is easy, and handled by the touch screen or D-pad. By touching a set of arrows on the screen, you can either turn left or right, move forward or backward, or even strafe. Timing your movements and how you move becomes an important strategy as the game moves on. Alternatively, you can use the D-pad and shoulder buttons for the same functions. You can switch between either mode at any time, since the buttons and the screen are both active at all times. The touch screen controls worked well, but seemed less intuitive than the standard buttons. To activate a switch, accept a menu option or attack you press the A button, or touch the appropriate item on the touch screen. Pressing X will allow you to quickly scroll through your weapons. Pressing the Select button brings up your magic map on the touch screen. This is the reason I used the button controls most of the time: you can use them and keep the map active on the bottom screen. Eli doesn’t talk much, which could be a good thing. The sounds in the game are another reason you can tell it was a cell phone port. The grunts and squeals the monster make are recycled, and the pain noises Eli makes are too frequent and pretty much the same, though that may have been player error. Music is nearly non existent, happening only rarely for key events in the game. Talking is done by text, and the only other real noises in the game are the mumbling Eli makes when drunk. The sounds come across as cheap or low bit. Violence is a bit more severe than I expected from a T-rated title, but not overdone considering you\'re whacking enemies with a sword. Tiny spots of blood fly off of enemies as you hit them. It gets worse after you kill them, as one enemy loses one of its heads, then falls into a bloody heap. In fact, most enemies fall into a dismembered heap of gore. You can smash the bodies as well, making a nasty crunching noise and sending bits flying into invisibility. And kill you will. Hundreds of enemies fall before Eli as he makes his way through the mountain. It’s not realistic 3D, but it’s still fairly nasty. Occultism is a bit of a problem too, as dark magic is used by your enemies. The final boss is a dark witch named Kai’ Laria. She uses her magic to hold the Dwarven souls from the afterlife, and talking to them is required to progress through the game. After you beat her, you see them leave for the afterlife. You can use Ellon to attack enemies, but his spells are elemental and more fairytale type. Potions are also used throughout the game, and you will eventually find a magic warhammer. I mentioned several times before that Eli can get drunk, but it is actually required in a few places. One of the Dwarves, Sarbok, asks you to drink with him before he will let you pass. It wears off after several turns, unless you wear Sarboks ring which keeps you drunk while it is on. The only other thing of note is that the Orcs pants ride a bit low, allowing part of their bum to hang out over the top. I thought it was funny, but figured it was worth a warning. Language is pretty non-existent, with “hell” being used as an actual location, and Ellon swearing “by the gods”. 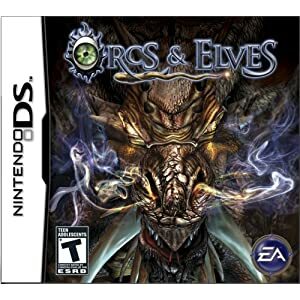 The title of this game grabbed my attention, because I enjoy fantasy, and especially Lord of The Rings. But obviously, LOTR and Orcs and Elves have very little in common. Low-budget, and based upon a very old system of play, I enjoyed OaE quite a bit. It’s a classic styled adventure game that would fit right in at a convention. If the content doesn’t bother you, and you\'re in the mood for an adventure, I could recommend this title. It is available for cheap now, with copies running for $10 currently.